Cuddeback is well known for their quality products, and with the E2 they introduce yet another high-quality camera for trail adventurers and enthusiasts. The Cuddeback Long Range IR Model E2 camera is a highly efficient device to help you capture movement and speed. It comes with an option for a wide angle view for monitoring fields and a centered view for trails. Recently I have been on a hunt for the top trail cameras available on the market. Let’s find out how the E2 compare. This camera is among the fastest trail cameras available on the market today. It boasts of a fast trigger feature that can take two pictures before many other models can only take one. The speed on the trigger of the Cuddeback is only a quarter of a second. This will enable you shoot more photos of your subjects with less errors. The recovery is as quick as well, allowing you to quickly capture follow up shots. One struggle with this trail camera is that it can be a little difficult to set up. The pictures may come up hazy or foggy especially when taken under not so good environment conditions. Although there are some complaints, they usually are because of user errors. If you prefer ease of use in your devices, I would suggest the Moultrie A8. However, these are just minor setbacks. With its affordability and speed, this surely is an excellent option for you to choose. If you are looking for a good quality camera at a reasonable price, then this camera is perfect for you. This Cuddeback device is a great choice for monitoring larger properties, where you might require more than one device at a cost-effective price. 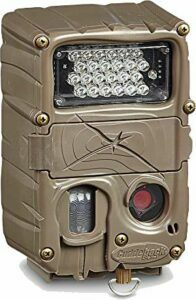 I feel like I have to mention my Simmons Whitetail Trail Camera Review here, as it is another device that offers good value at a affordable price.